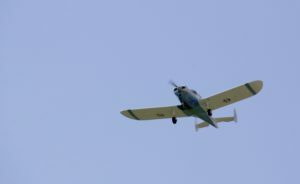 In the words of the younger set, my son Rio was “totally grossed out.” We could hear the whine of the radial engines. See the distant smoke. Catch a flash of the setting sun off of the windscreens of the cartwheeling planes. But we were totally missing the Tora, Tora, Tora air show because we weren’t at Wittman Regional airport. We were six miles away. In the parking lot of La Sure’s Banquet Hall. We’d missed the one thing he wanted to see most due to a schedule conflict. The family airplane is a 1947 Ercoupe 415-CD, and last year was the 75th Anniversary of the type certificate. We’d flown a thousand miles over three days to take part in the celebration, and the capstone of that celebration was the Ercoupe Owners Club banquet—which happened at the exact same time as the airshow. He’d also missed out on another experience he was looking forward to: Flying into AirVenture. We didn’t fly into it. We flew to it instead, which is an altogether different thing. It’s a long story, but we were supposed to be part of a 75-plane arrival squadron that didn’t end up happening and I hadn’t studied the NOTAM thoroughly enough to be safe flying in by ourselves. Instead of sitting on the grass with the other Ercoupes, our baby was in a hangar in West Bend, 45 miles to the south. Buying Rio rides on the Tri-Motor and the Bell-47 let him technically fly both out of and into AirVenture—twice—but I guess that didn’t count in the eyes of a pre-adult. (He hates the label teen-ager). I started flying when I was seventeen. Like many pilots of my generation, my aviation career is full of potholes: Periods when life, work, or lack of money put my passion on the backburner. I was flying when Rio was born, but had already become a rusty pilot again by the time he was out of diapers. So while he didn’t grow up in a flying family, he grew up with the knowledge that his father used to fly airplanes. I searched for words to describe the surge of energy that shoots through the body as the plane accelerates down the runway, the exhilaration that floods the mind at the moment of rotation, the heady rush as the ground drops below you and the magic of aerodynamics lifts aluminum and plastic and steel into the air. There was a better solution than words. “I’ll show you,” I said. A month later, I was current and Rio—then eleven years old—and I took to the sky over Santa Fe, New Mexico together. The kid has never been the same. If you could only study one subject, I can’t think of one that would teach you more than learning to be a pilot. Flying encompasses a university of disciplines. Mathematics. Physics. Aerodynamics. Engineering. Meteorology. Communication. Cartography. Geography. Law. Perhaps more importantly, flying develops the mind through instilling mental discipline, concentration, planning, prioritization, and decision-making. It develops the body through eye-hand coordination. It develops character by imparting pride and confidence in self and skill. And it paves the path to a bright future through the knowledge gained that you can do anything you set your sights on. All children should be taught to fly. Rio is a very literal person. He always rolls his eyes and says, “Dad, we don’t have a back.” (Ercoupes are two-seat planes.) “Plus, you don’t smoke cigarettes.” I sigh and resort to surfing eBay on my smart phone while the boy-pilot keeps us smartly on course. Last year I joined the Sport Air Racing League for reasons I can’t quite seem to articulate to my wife. (Who wouldn’t want to race airplanes?) And while the season is still young, our unlikely race plane is in 2nd Place in the League. As we were looking at the locations of the various races and trying to decide which ones we could get to, and which ones were too far away, our eyes fell to the AirVenture Cup. Rio has been copiloting to and from many of the races, but not actually racing with me. Partly because his mother put her foot down over her “baby” careening around pylons at 400 miles per hour, 30 feet off the ground with his insane father (this is NOT the kind of racing I do, but this is what I get for taking her to a Red Bull Air Race and watching videos of Reno in the living room); and partly because having an extra person in the plane slows it down quite a bit. But I promised him he could fly one race with me. So we have our hotel reservations, and together we’re working on our flight planning to Mitchell, South Dakota. As with all our flying adventures, we’re having a blast. From planning, to preflight, to launch, to flight, to recovery—there’s nothing Rio doesn’t love about flying. Except cleaning the plane. I haven’t been able to get him on board with that yet. But he’s excited to be racing. He’s excited to be returning to AirVenture—in an airplane this year. He’s looking forward to Tora, Tora, Tora, air show. And me? Well, of course I’m looking forward to the flight, the race, and the show. But the real thrill for me is to sit “second seat” to my son’s development, through flying, from a boy to a man. A young man that I’m damn proud of.